ParaNexus Blog - From the Desk of Brian D. Parsons - Ouija Board: Conduit of Evil or Belief? ParaNexus Anomalous Research Association > Forum > Blog Directory > From the Desk of Brian D. Parsons > Ouija Board: Conduit of Evil or Belief? A common first line to many who take the adventure of playing with a Ouija board. 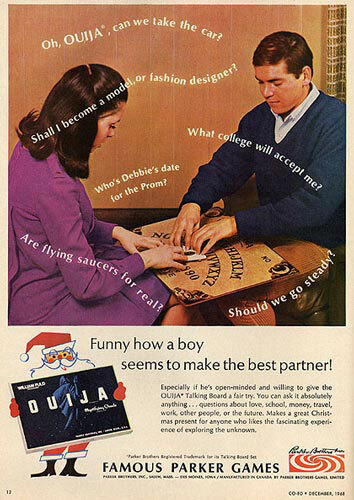 First of all, Ouija is a registered trademark of Parker Brothers, a subsidiary of Hasbro, and it's a board game made of plastic and wood. So, what's the fuss? 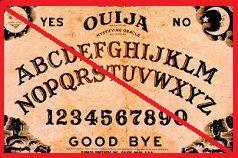 There is a huge debate in the paranormal investigation field about the use of this board. Many groups will not help a client in need if they find out that a Ouija board has been used. Many groups will not use a Ouija board or any other "old" divining technique for various reasons despite possibly never using any. Christian-based organizations teach that Ouija boards are inherently evil and are the conduit for demons and the Devil; any Earth-bound "ghost" could just be a guise for the Devil himself (party poopers) or anything else made of pure evil. 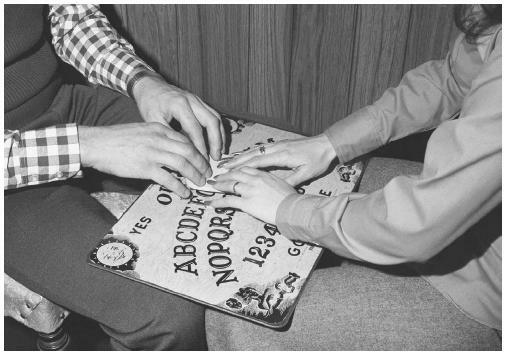 Many "regular" people claim to have had bad experiences derived from using a Ouija board; including ghosts following them everywhere, poltergeist-like activity, possession and other unpleasant activity. So, why does Parker Brothers continue to sell this game if it is so bad? I'll skip the history lesson behind the board, if you want to know more about it you can go here, here, here, here or here. There exists a logical explanation behind what makes a Ouija board work, or rather, how the planchette (plastic piece you place your fingers on) moves. It's called the ideomotor effect and basically your fingers move the planchette without you really realizing it. You may ask or hear a question and then your fingers move to an answer that seems appropriate all without you thinking about moving to that location. Yep, it's been proven scientifically. So, does this explain all of the accounts of people using Ouija boards? What about all of those people experiencing ghosts and poltergeists and stuff? This is where the belief part comes in. Who's to say there wasn't a ghost there all along? Maybe the subject's sudden open-mindedness caused them to finally interact, OK, maybe that's a stretch, but it's possible for some cases. Maybe they just believed so hard or were scared witless that every little creak caused them to think a ghost was responsible (jumping to conclusions is a recognizable part of being a ghost investigator- we see it a lot!). A famous research project from the Toronto Society for Psychical Research proves that they actually "created" poltergeist-like activity in 1972 which ended up tipping a table numerous times, the activity was caused by those involved because of their belief in what was going to happen (See Phillip). Regardless of the events that occur, and if they are really paranormal, is it really the fault of the board? Very doubtful and most people realize it's the people and the way they practice that are responsible. If someone believes they opened a portal to Hell, does it matter what they used? It’s the belief that causes the effect, not the tool. A major explanation many paranormal investigators give against the use of this board is that they can "open" doorways to uncontrolled spirits, ghosts or other malevolent beings. Asking random ghosts can invite terror that cannot be controlled without a psychic. Hmm, notice anything familiar? The approach used by a Ouija Board and the "scientific" tools are really the same, does it really matter if you call out "Joe" or just for anyone? Why would an electronic tool be any different than a piece of cardboard? The tools measure the environment and can tell us when ghosts are present you say. I say the tools do measure the environment, which is in constant flux and can be unpredictable and not every unexplained blip is paranormal (has anyone heard of the inverse square law?). If you really want to get picky about it consider this; a ghost has never been proven to be able to be detected by an EMF detector or any other electronic tool despite what you see on television. A fancy light on your EMF detector does not mean a ghost is present no matter what kind of questions you are asking, granted, an EVP at the same time would make a great argument. The point is, why is it OK to use these tools and not a Ouija Board when you are essentially doing the same thing? Measurement? OK, nice comeback, but how good are your controls? Did you thoroughly measure the environment with multiple EMF detectors in the same environment you are investigating in? Fine, the Ouija Board doesn't look cool and yes, it does carry with it the negative connotation and sense of careless pursuit versus fancy lights and expensive gadgetry. Whose fault is that? Why are ghost investigators continuously perpetuating this perception to the public when our methods are the modern day version of this old game and tool? Yes, I agree that Ouija Boards should not be used on investigations. The reason for this, as I explained above, is because of the ideomotor effect. The board offers no real information beyond subjective influence and will only add to the drama already in progress. If such horror can be created by attempting to connect to unknown entities then why is it perfectly fine for an investigator to go into a prison, hospital, or someone’s home and ask for random ghosts to interact with them? First off,thanks for the great write up. I have often questions the "lore" around the evils of the ouija board. Two trains of thought come to mind. First off, the main different between a EMF or EVP device and a Ouija board is that with a Ouija, the spirit or enity is acting THRU the perosn or persons using the device. With the modern tools, they enity intectact directly with the device. You are not inviting anything to "act thru you" therefore no chance of being over taken by a "evil muntant zombie biker from the darkest reachs of hades" or your mother in laws deceased pet goldfish. It is the act of giving one's "self" up or over to something less then pleasant which adds to the fear of the object. Strictly speaking it is tough to get a fale positive reading from a EMF meter based on nerves, but you can make the center piece move just by geting the shakes. And the second is this, with a Ouija board, you can generate "false positives" unknowingly much easier then with the more modern tools. Thou you can get scared just as easily by either, with the new tools we use, you aren't likely to but freaked out by your EMF going off near an outlet or Digital recorder. It's the belief that you are "opening a doorway" of sorts that gives the Ouija board it rep. Once again, it is truly easiest to be afraid of what you don't understand. Belief is the only real power any object has, and if you want to, you can transfer that belief to any object. Excellent, balanced, and insightful article. I especially like, "At left: An electronic Ouija Board invented in 2008" indicating the KII EMF meter! Your article underscores the need for investigators to remain balanced and objective, devoid of superstitious beliefs. Nice job! Being raised Catholic, I was not allowed to have a Ouija board in the house (though my sister and I had one hidden under the bed). We used it on many occasions and had alot of fun with it, thus, the power of belief. We never really believed that "ghosts" were talking to us, and we all knew that one of us was moving the planchette. I have to say though, I did an investigation and got amazing response to questioning with the KII meter (I have it on video, all the way to red for most questions). Now I am wondering, were WE manipulating the KII, sort of creating our own poltergeist? Was a spirit answering our questions? This place was shockingly active, but it really makes me think! Thanks for this well though out article! It's possible the power of suggestion, belief, or coincidence caused the meter to spike. Also remember that anything electrical can make the meter jump (we tested a walkie talkie from about 100 yards across a parking lot once). Thanks for the kind words on the article! Page created in 0.064 seconds with 142 queries.